Dubai, UAE, January 10, 2017: Homegrown swimwear brand COÉGA Sunwear is continuing to broaden its support of community-led water sport activities across the region by partnering with the 8th Annual Around The World Charity Paddle (ATWCP) scheduled to take place on Saturday 28th January at Sunset Beach, in Jumeirah Dubai. 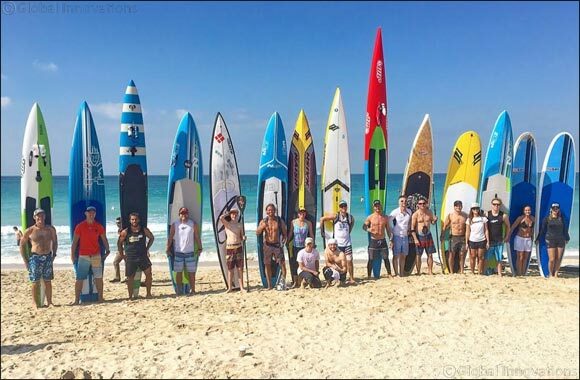 Organized by Surf House Dubai, the ATWCP is a 30 kilometer paddle around the Nakheel World Islands, an archipelago of manmade islands off the stunning Dubai coastline and is being held in support of the UAE Red Crescent. The non-competitive event is open to all non-motorized man-powered water craft including SUP, Surf Ski, Kayak, Prone Paddling, Outrigger Canoe and Dragon Boats, and entrants are anticipated to take between 4-6 hours to complete the endurance course depending on their speed and ability. Last year the event collectively raised over AED20,000 to support non-profit organizations and this year event organizers are hoping to exceed that amount with help from leading brands such as COÉGA Sunwear, who will be providing co-branding at the event as well as supplying rash vests to staff and participant packs to some 90+ entrants. The 8th Annual Around The World Charity Paddle will take place on Saturday 28th January from 6AM at Sunset Beach. The event will finish at the same location.